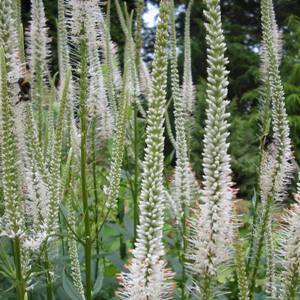 With its slender spikes of white flowers and interesting whorls of foliage, this is a must-have for a mixed herbaceous border, adding height and sophistication. The name Veronicastrum literally translates as resembles Veronica, which is a better-known genus in honour of Saint Veronica, thought to have provided her veil for Jesus Christ to wipe his face on the way to Calvary. There are just 2 species of Veronicastrum – one from Siberia, and V. virginicum from the prairies and savannahs of North America. This plant will attract bees and butterflies to your garden, as well as adding movement as it sways gracefully in the breeze.